QAthlete Orthostatic testing is the quantitative and qualitative assessment of the fitness and health levels based on HRV analysis. The test is quick and effective and begins with the attachment of simple, noninvasive electrodes, attached as instructed. The candidate is instructed to stand for two minutes followed by sitting for 30 seconds followed by standing for 30 seconds. The full process is repeated alternately for three minutes. The data collected from mean cardio tachogram and spectrum is analyzed to produce eventual results in both quantitative and qualitative format. 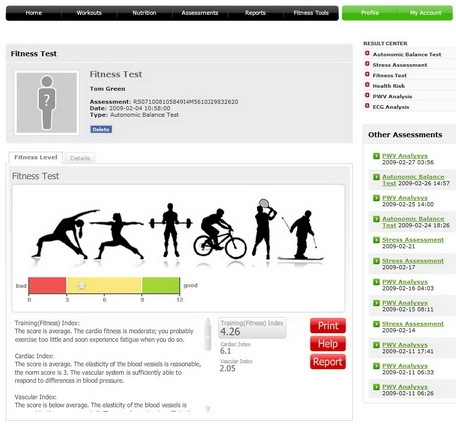 Fitness assessment measures the response of the heart-vascular reaction during orthostatic stress (i.e. moving from a seated to a standing position). This response includes vasoconstriction of the peripheral blood vessels (arterioles) and an increase in heart rate. These two regulatory responses protect the brain from a serious decrease in oxygen supply as the body moves from seated to in standing. QAthlete measures and calculates the change in the cardiotachogram and in the frequency spectrum of the cardiointervals during the test. These two factors are dependent upon individual fitness levels which determine the ability of heart and blood vessels to overcome orthostatic stress. Evaluating a patient's ANS state using QAthlete's Vitality Test before and after any treatment can provide an accurate and reliable evaluation of treatment efficacy. In cardiology, for example, it is important to assess the effectiveness of beta-blockers in order to optimize the therapeutic strategy and in clinical pharmacology, is vital to assess the influence of various medicine on autonomic function. QAthlete Fitness assessment are useful for analyzing the health of those suffering from cardiovascular disorders such as high/low blood pressure, myocardiosclerosis, different types of myocardiopathy, myocardial stroke, heart transplantation, etc. Data gleaned from QAthlete testing can be used to supplement traditional procedures, providing an extensive, comprehensive assessment of the cardiovascular system. Statistically important relationships exist between the Vitality Test results and the results received from the veloergometric test assessment of maximum work capacity. QAthlete Fitness Analysis is the result of several years of applied scientific research involving athletes, everyday adults and cardiovascular patients. As a result of this thorough research and testing, conclusions can be drawn regarding correlations between assessment results and associated health risks. A statistically important correlation has been determined between the Fitness analysis results and the veloergometric assessment of the maximum working capacity. The advantage of QAthlete Vitality Testing is an easier, faster and safer execution which makes it suitable for mass preventative examinations.